B Ryan Decorators is a very experienced and professional painting and decorating company based in Barnsley and Wakefield. We can cover all of South Yorkshire as well as all of West Yorkshire. 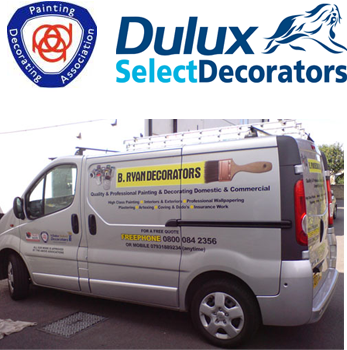 Having professional Dulux Select decorators, all our work is done to the very highest standards whether it is a customer’s home, office, pub, club, new build, factory, etc. All our work is fully insured and comes with a free 24 month guarantee. Our reputation is built on customer satisfaction. We specialise in wallpapering, plastering, interior and exterior painting and decorating - both domestic and commercial. Joinery - from a single door to fascias, skirting boards, kitchen fitting and laminate flooring etc. Roofing - from flat roofs and repairs, to full roof re-tile work and ridge tiles, repointing and chimney stack, repointing and facias and gutters etc. Electrical - from a single socket or light fitting to full rewires etc. Plumbing - from radiators fitted to full central heating systems and boiler services and full bathroom installations. Tiling - from bathrooms and kitchens to walls and floors etc. We are available seven days a week and provide free written estimates. B Ryan Decorators cover all of South and West Yorkshire. In South Yorkshire B.Ryan Decorators have painters and decorators in Barnsley, Rotherham, Sheffield, Doncaster, Chesterfield and any surrounding areas. In West Yorkshire B.Ryan Decorators have painters and decorators in Wakefield, Dewsbury, Bradford, Castleford, Pontefract, Batley, Huddersfield, Leeds, Holmfirth, Halifax and all surrounding areas.